It’s ‘back to school’ season for much of the Northern Hemisphere. Along with setting up classrooms, decorating bulletin boards, and preparing lessons, many educators are also considering their virtual spaces. There are so many benefits to having a class blog! A class blog can a virtual space that complements a physical learning environment for all age groups. If you don’t know anything about blogging, don’t worry! We have a free self-paced course for teachers that walks you step-by-step through the process of setting up a class blog and blogging with students. You can even join our 30 Day Challenge at any time to complete the 11 step course over a period of one month. 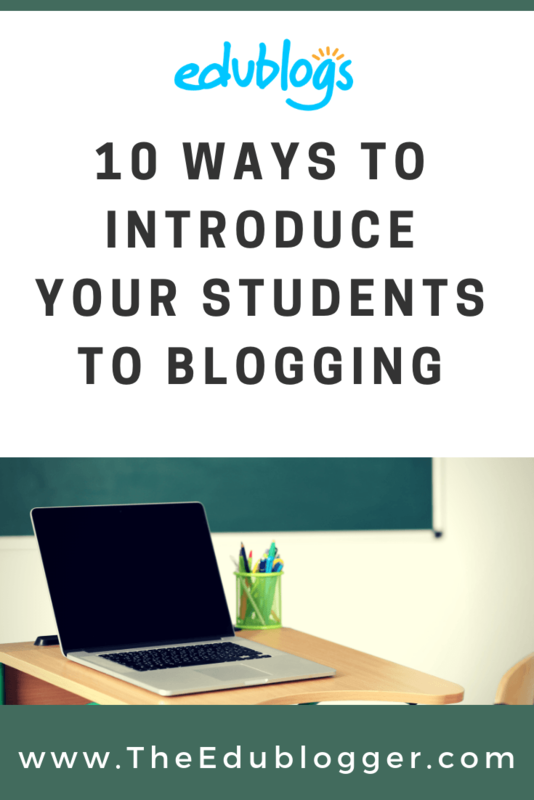 In this post, we’ll show you 10 ways you can introduce your class to blogging. Be sure to share any of your own ideas or experiences in a comment! If your students are new to blogging (or need a refresher) you might want to start by showing them this short video. The video goes through the terminology of blogging and explains how blogs are used. For a simple follow-up activity, check out this blogging vocabulary crossword. Have you caught on to the Kahoot! craze? It’s a free tool that allows you to create and play engaging learning games (called Kahoots). The multiple-choice questions appear on the screen in the classroom and students submit their responses in real time using their computer, tablet, or mobile device. Students can work in teams and can work for points (most correct answers and quickest responses). We’ve made an Introduction To Blogging Kahoot. It goes over some of the key terms, vocabulary, and uses of blogs. There are 15 multiple choice questions. To access the Kahoot, click on this link. You don’t need an account to play, however; you will need to log in if you want to edit the quiz (we encourage you to adapt it for your own students if necessary). You also need to be signed in to save results. You’ll have the option for your students to play against each other individually (classic mode) or in teams. You’ll also have a variety of game options you can play around with (see below). Once you finalize your selections, a game pin number will show up. Students will go to the Kahoot app on their device, or to https://kahoot.it/ and enter the pin number to begin! Having your students explore examples of different blogs can help them learn more about blogging and gather ideas. If you’ve blogged with students in previous years, you might opt for your new cohort to look at former students’ work. Alternatively, we have a list of class blogs that might be helpful. Check it out here. You might like to simply send students to this list, or handpick a few blogs that you’d like your class to look at specifically. The blog exploration could be a whole class exercise or students could work in small groups. What is the writing style like on the blog — casual, formal, academic? What safety or blogging guidelines can you find on the blog? How are pages used for static information? Are the posts time specific or ‘evergreen’? What images and multimedia are being used? Is there are sidebar? What is its purpose? How has the text been formatted to make it easier to read — are there headings, bullet points, or colors etc? How does digital writing differ from analog with hyperlinks etc? This exploration can lead to a valuable classroom discussion; students could share ideas and examples that they could bring to your own class blog. Paper blogging is a concept that has been going around for years. It can make the abstract concept of blogging really concrete for students. Have students handwrite a blog post on paper (make it simple, like a hobby or recount of something that happened at school). Put paper blog posts on walls or around the room for everyone to read. 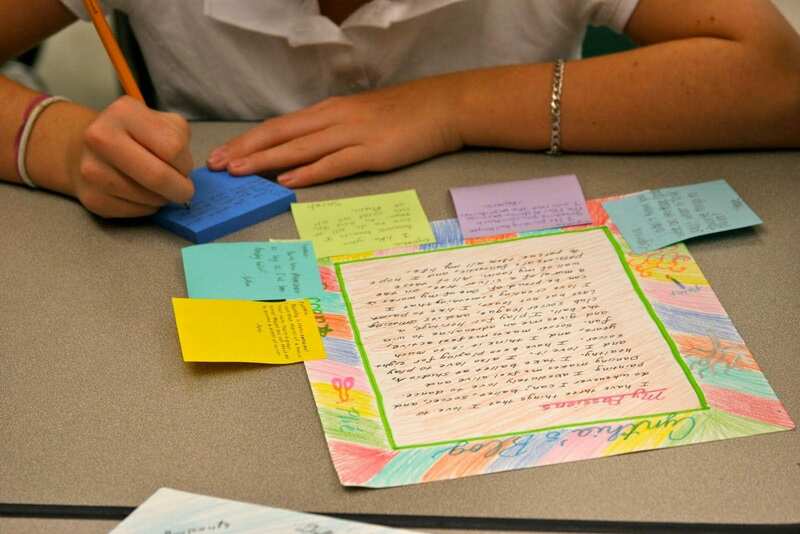 Using sticky notes, all the other students can comment on the paper blog posts. You can have discussions about what makes a great comment and how blogging can create a community in your classroom. Check out this paper blogging example from Karen McMillan on the Notes From McTeach blog. It’s a good idea to discuss or inform students of your safety guidelines for your blog ASAP. As students are exploring other blogs, you might have them look at safety guidelines to see what information is being published. Have them consider what information might be kept private? What are they not seeing? This visual below from my post about digital footprints might provide some useful reminders or discussion starters. 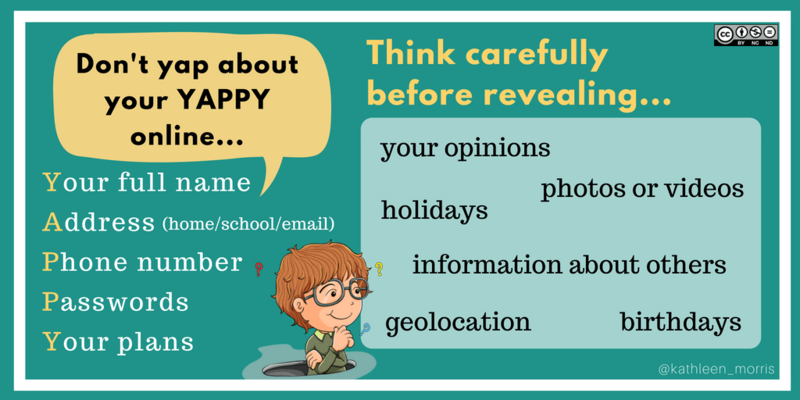 While there are many things that definitely shouldn’t be shared in your blog posts and comments (YAPPY), there are some grey areas. Students should be encouraged to think before they post and always discuss anything they’re unsure about with an adult before posting. Having the teacher publish posts first, and having the students comment can be a really good way to set the scene for a quality blogging program. It gives you the opportunity to teach the students explicitly about quality commenting while helping them learn the basics of blogging. Even if you want students to be publishing posts down the track, strongly consider having the teacher publish first. This could even be an introductory post where students can practice leaving quality comments to introduce themselves and answer comments. Having the teacher post and students comment might be the model you continue with for the whole year, or after a post or two, you might have students post on the class blog, or on their own blogs. Often, this depends on age and experience as well. Many teachers like to give a gradual release of responsibility as demonstrated in the graphic below. *Note the option for students to ‘earn a blog’ is something some teachers try if they’re just starting out, teach young children, or face obstacles like limited technology. Teachers don’t have to be the expert when it comes to setting up your blogging program. 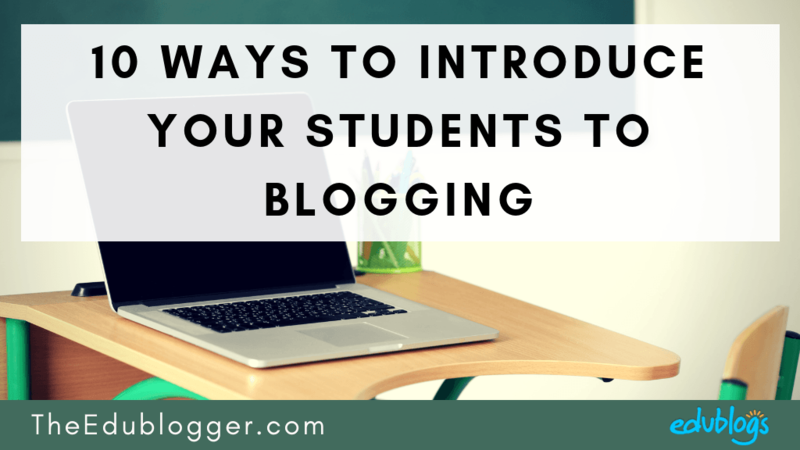 While you’ll definitely want to keep an eye on things, especially in terms of what’s being published and your safety guidelines, you can have students help other students learn about blogging. 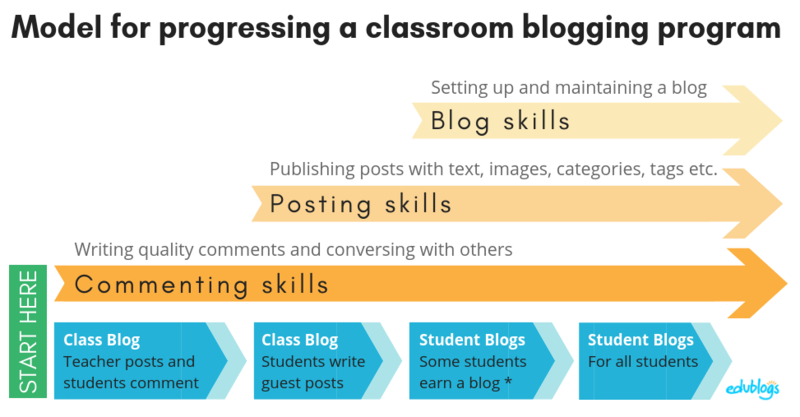 Perhaps you could have a small group of students dedicate some time to learning about blogging (perhaps through the Student Blogging Bootcamp — see below). Your ‘tech-perts’ could then come up with some activities to introduce the rest of the class to the blog. I’ve even heard of students in classes setting up ‘online courses’ for other students in their class! If you’re interested in assigning your students a self-paced course which walks them through the process of setting up their own blog, check out our free Student Blogging Bootcamp. There are 10 steps in the course. You could assign students one step per period, or let them work through the whole series at the own pace. Alternatively, you could pick and choose and just assign students a handful of the steps. Have a look through the course and see what would work for your class! 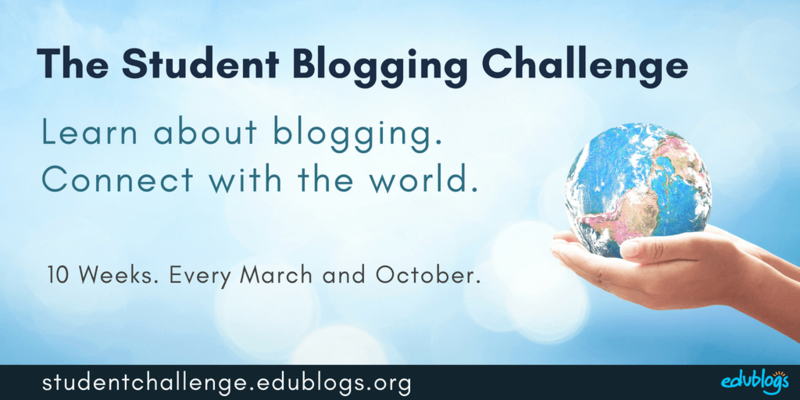 Every March and September, the 10 week Student Blogging Challenge is held. The Student Blogging Challenge is totally free and open to students or classes from all over the world, using any blogging platform. It’s most suitable for students between the ages of 8-16. The next challenge begins October 7, 2018. You can register as a class, individual student blogger, or commenter. One of the many benefits of having a class blog is the strengthening of home-school relationships. It’s never too soon in the school year to start involving families. Families and students can learn about blogging together! Long time blogger Linda Yollis has found the first posts of the school year can be ideal for connecting with families and students. Check out Linda’s Welcome Back 2018-2019 post. It includes a personal video message and an invitation for students and parents to comment together. There were many rich commenting conversations between members of the classroom community. What a great way to learn! If you’re looking for more ideas on how to educate and involve families in your blogging program, check out Step Six of our Blogging With Students Teacher Challenge. How do you introduce your students to blogging? We’d love you to share any ideas or links you have. If you try any of our suggestions above, let us know how you go! Thank you for showing us how to blog. Very Helpful! By the way on your free time can you check out my first new blog. And tell me your opinion on it just to help me out. It would be very helpful. Thank you! I love the idea of blogging in an educational setting. Creating a place for students to reach out to one another, and connect with people from across the world is a great way for students to develop their socialization skills. Are there specific sits I could utilize in order to make the blogging experience better for my students? Hi there, what sort of sites were you thinking of? Tools you can embed? Blogging so far is going well. Check out what I have to start. Keep going. You’re off to a great start! It’s actually my first time blogging and I’m extremely eager to understand all the features and special tricks that the website offers so I can show my students how to create fun and interactive blogs! Hello! I am a preserving teacher from the University of Northern Iowa. In my educational technology and design course, we are being introduced to blogging. I love these 10 steps that break blogging down into specific steps. My favorite step is having the students comment on their teachers blog to begin with. 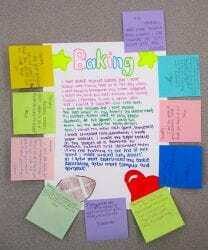 It is a great way for the students to get a feel for how it works before they have to write a post on their own. It will also facilitate their creativity for what they will blog about. These are all great steps that lead to different activities for the students. I will definitely be using some of these resources, thank you in advance! Thanks so much for taking the time to comment. Good luck with your studies and hopefully you will be blogging with your own class before you know it! Your son should know his URL. It’s probably best to check with the teacher if you’re not sure. Our blog is successfully created.